GBA Services provide Dedicated Transport Solutions with an integrated depot network throughout the UK and extensive European and Worldwide partners. We’ve developed their new website in collaboration with Curious Road. The WordPress website is designed so there is no vertical scrolling on desktops and laptops. This is done through the horizontal scrolling navigation and the modified lightboxes. The site also displays well on mobile and tablet screens because it’s built using Responsive Web Design. 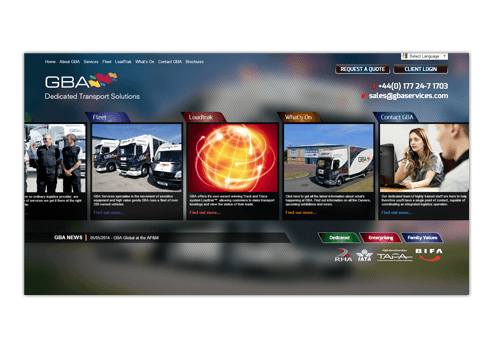 Within the site there is additional functionality which features a 24/7 transport quotation service, freight tracking service and promotional videos.